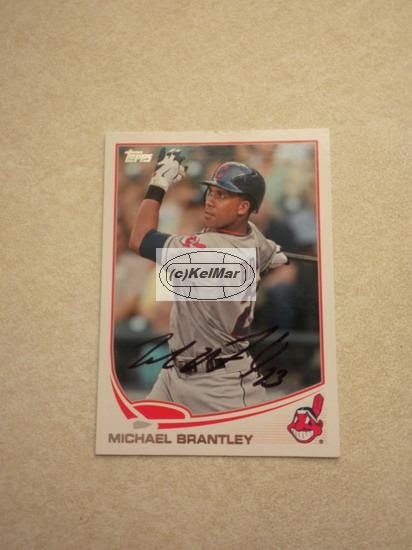 my 11th Brantley autograph didn't come until the 2014 season ended on September 28. after the game against the Tampa Bay Rays, i went to the players parking lot, like i always do. i attempted to get Michael's autograph in the parking lot 3 other times this season, and i was taking no chances this day. i went straight over to the gate where his parking spot is. i gave my mother one of my unsigned Brantley baseball cards to try and get signed while i hung onto a photo of my last birthday cake--a picture of myself and Michael from BPX 2012--for him to sign. Michael got a new parking spot mid-season, by the way. he took over Justin Masterson's spot in the back corner, which makes him much more accessible to fans now. as a result, he has been signing after games more than i've ever seen him sign before. however, he doesn't sign for everyone, just a handful. and the 3 previous times i was there that he signed, i couldn't get him to sign for me before he left. until this day. okay now back to the story. i was standing near the area where Michael was signing the night before, and my mother was a couple feet to the right of me. Michael had this season finale game off, so we didn't have to wait long for him to come out. he wheeled his suitcase down to Tomlin's truck and one of the ballpark workers followed him to the truck, too. this is when more fans started crowding around the gate and screaming his name for him to sign. he was literally 1 foot in front of us and some people just kept screaming. after putting the suitcase in the bed of Tomlin's truck, Michael opened the 2nd passenger side door and started moving the muscle milk that was there into the bed as well. he was clearly in the middle of something, but the fans wouldn't shut up, so i yelled, "he can hear you!" which got some laughs. the worker guy was also helping move the boxes of milk and Michael was telling him that he was the one who recommended the milk to Tomlin. then one of the boxes that the worker guy picked up ripped and fell to the ground. soon after, Tomlin arrived at his truck. he was going to get in the driver's side but some fans called out to him so he went to sign for a few people. Michael continued talking with the worker guy behind the truck for a minute and then he came back around the passenger side. everyone started trying to push their way to the front of the gate and stick their hands through it. somehow, the "parking lot regular" squeezed his way up next to the right side of me. and everyone who was already right up front, myself included, got squished. a few seconds later, all the sudden i hear my mom say, "someone is pushing down on my head." my first reaction was to go into defense-mode and scream "get off my mom!" and push on the guy who was pushing on my mom. except i couldn't move because i was still being pressed up against the gate even though Michael wasn't signing anywhere close to me at that point. but then immediately after that i thought, yes! her being vocal about being "hurt," whether real, exaggerated, or a made up ploy for attention, could potentially make Michael feel bad that someone was being harmed--ultimately because of him--and consequently give her an autograph. (why didn't i think of that?!) as i'm thinking both these things, i saw Michael look up from whatever he was signing at that moment and say, "can you move back, please?" and he kinda motioned at the big guy standing behind my mom. that guy claimed he, too, was being pushed and tried to excuse and dismiss his behavior. right after that, Michael signed for my mother (but i couldn't see who he was signing for at that time). he only signed for a few more people before getting into Tomlin's truck. once the crowd cleared out, that's when i met back up with my mom and she handed me the signed baseball card while recapping what had just happened. Tomlin and Michael didn't leave right away because they were sandwiched in the parking spot by other cars and had to wait for the parking attendant to move them. so i took a few (crappy) pics of Michael on his phone in the truck before they drove off. i didn't take any pics of him while he was signing because both my hands were occupied shoved far through the gate in my auto attempt, which ended up being pointless.